Yesterday, SF anthologies Martin H. Greenberg passed away after a long battle with cancer. For those in the field, Greenberg was a giant, and to me personally, he was someone I admired, respected, and was influenced by. I've edited several anthologies over the years, and in the back of my mind I always hoped to some day edit an anthology that was as good as the ones he edited...maybe some day. The SF field has been greatly diminished, and he will be missed. I just wanted to remind everyone in the Denver metro area that I will be reading from, and signing copies of Red Moon Rising tomorrow at the Broadway Book Mall at 3 pm. The Mall is located at 200 S. Broadway in Denver. I've had quite a few people tell me that they're planning on attending, so you might want to get there early. My contributor's copy of the new issue of Aoife's Kiss arrived earlier this week. It's a big thick issue since it's an anniversary issue, and it looks like there's some great stuff in it. I can't wait to actually find time to read it...yes, I hear all of the laughing. I recently got an e-mail from someone (who shall remain nameless) telling me what's wrong with Ephemeris. For those of you that are new to this blog, Ephemeris is a science fiction RPG that I'm the co-designer of. According to this fellow, the problem with the game is that it doesn't have rigidly defined rules. Instead, a lot of the game play is supposed to be created by the players and the game master. Apparently, I don't know much about gaming because that's what an RPG is to me. When we created the game, we wanted something that was going to have a wide open playing style, much like the original and the Advanced Dungeons & Dragons games. We didn't want to tell you exactly how to play the game, but apparently that was what this guy wanted. Sorry. We wanted a system that would allow you to create your own campaigns, and given that the setting is the galaxy, well, there should be a lot you can do with that. 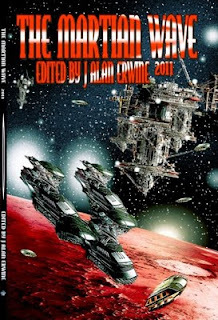 The 2011 issue of The Martian Wave is now out. This is a magazine that I edited on-line for many years, and the 2011 issue is the second print issue. There are some great stories in this issue, and I'd recommend a copy for anyone that has an interest in the exploration and colonization of space. Where are we going? What will happen once we arrive? Will humanity endure, and if so, will we like what we become? The short answer is: we don't know. But we can guess. In The Martian Wave you'll find stories that make some very good guesses. You'll find heroes and heroines, characters to love and to loathe, and above all you'll find people very much like yourselves trying to find out what's out there, examine it, cope with it . . . and live. The 21st Century holds many surprises for humanity. The Martian Wave will give you a few hints. This issue of The Martian Wave includes six evocative tales and five thought-provoking poems that will launch you into escape velocity! Bear witness to first contact with the starship crew of Molly Brown and an alien observer as they communicate via music in “Grand Ol’ Opry” by Laura R. Givens. Join Captain Anjela Stewart and her first mate Chris Lockwood of the Venture Forth, in Robert J. Mendenhalls’s “Full Moon”, as they, and other refugee ships, are turned away from Beta and Moon Base, seeking sanctuary in the wake of earth-destroying asteroid XF11. There are other unique and breath-stealing tales. . .from Robert N. Stephenson’s “A Miner Delay” where AI 7-12 Silva argues with his human-centered boss that he deserves to be sent to earth for an emotional and physical upgrade; Douglas A. Smith’s “Hydrogen” takes you on board the Sir Francis Drake while the crew wrestles with a sudden incapacitating illness. . .Is it connected to their propulsion systems? Dan Thompson’s “Terminator”, propels you into imminent disaster with Engineering Architect Ben Gage and Colonel Katerina Petrovna Mayakovski as they attempt to reform an asteroid to house refugees from the Belt Confederacy and the United Nations of Earth war--amid the imminent threat of an Assassin attack! ; and N.E. Chenier’s “Latency”, where research vessel Naut-47 is investigating HRK-a for developers of human colonies. The science crew discovers that not only is the planet suitable for habitation, but there’s something in the environment that expands their latent potential exponentially—but at what cost? Poets Lee Clark Zumpe, Kristine Ong Muslim, W.C. Roberts, and Shelly Bryant extend their creative tethers across space from “gilded captivity” in an alien zoo to a space trader who sells his organs to survive! The June 2011 issue of Aoife's Kiss has just been released. This issue features my short story, "R-Complex." The story looks at who's crazier, government or radical religion...tough call, eh? 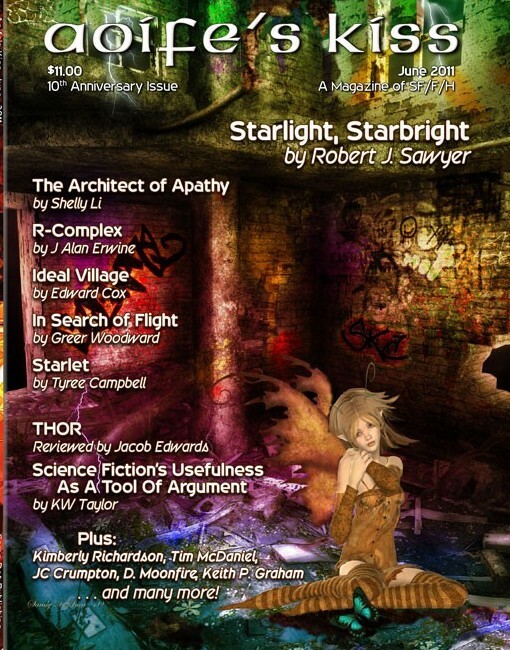 Also in this issue is a short story from Robert Sawyer...yes, that Robert Sawyer. It's nice to share pages with such a great writer. This is it: our 10th Anniversary issue. It's a Double Issue! The cover features Sandy DeLuca's "Lonely Night." Inside you'll find a short story by multiple Hugo Winner Robert J. Sawyer, who makes his debut with us. You'll also find a heap of other names, some familiar and some new, in this spectacular double issue, including Shelly Li, Greer Woodward, Marge Simon, J Alan Erwine, Tyree Campbell, Tim McDaniel, D. Moonfire, Edward Cox, Terrie Leigh Relf, Kimberly Richardson, Keith Graham, Dawn Marshallsay, Bruce Boston, Yunsheng Jiang, Shelly Bryant, Marcie Lynn Tentchoff, K. S. Hardy, and many, many more. There's also another writing article by KW Taylor, and a review of the movie "Thor" by Jacob Edwards.